India's experienced wicket-keeper batsman Mahendra Singh Dhoni is not part of the team in the domestic T-20 series against the West Indies. In such a situation, Rishabh Pant and Dinesh Karthik have the opportunity to prove their worth. Rishabh Pant could not play in the first match, but Dinesh Karthik (31 *) came true in the role. India defeated the current world champion of this format by five wickets with 13 balls remaining in the first match. India also broke their chances of not winning the Windies from the last four matches. After the year 2014, India's first win on the West Indies in T20. Indian caretaker Rohit chose the first bowling in the Eden Gardens, who had been impressed by the dew. The verdict proved right Under the leadership of spinner Kuldeep Yadav (3/13), the West Indies could only manage to score eight wickets for 109 runs with the spectacular display of Indian bowlers. 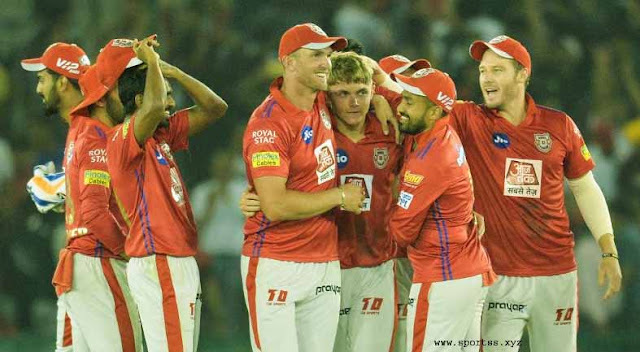 The hosts won the match by 110 runs in 5 wickets in 17.5 overs. The second match will be played in Lucknow on November 6. It seemed that the Indian team, who won the Test and ODI series, would easily achieve the target of 110 in T20 but the Windies young pacer Oshne Thamas (2/21), who bowled at 147 kmph per hour, Rohit (06) caught behind the wicket and Shikhar Dhawan (03) was uprooted only by the middle stump. The return of pavilion of Lokesh Rahul (16) and Rishabh Pant (01) in the opening spell of Captain Carlos Brethet (2/11) had made the journey of the hosts a difficult one-off course. The score was just 45 runs on the board and four batsmen were dismissed. Dinesh Karthik and Manish Pandey (19), who played for Kolkata Knight Riders in IPL, played a useful 38 runs pair on the fifth wicket. Young spinner Khari Pierre caught Manish on his own ball. 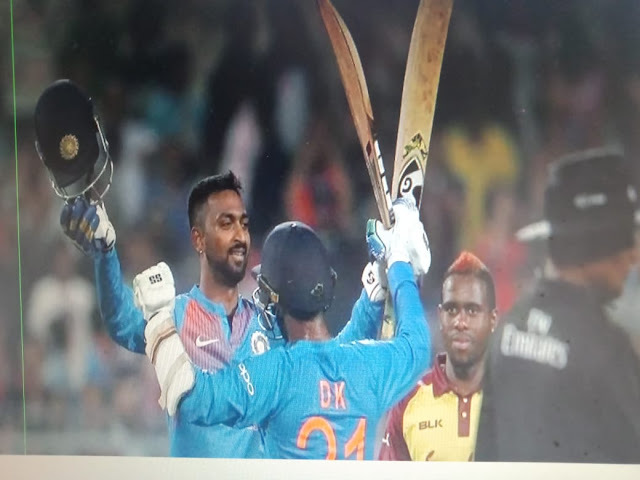 After that Dinesh Karthik ensured victory with the newcomer Krupal Pandya (21 not out). In the ninth over, Kuldeep Yadav took the wickets of Darren Bravo (04), Rovman Powell (05) and captain Carlos Braithwaite (04). Kieron Pollard, who is in the West Indies squad for the T-20 Series, becomes the first victim in the international T20 format of the Kunalal. Crunal, brother of injured all-rounder Hardik Pandya, has shown his ability in the IPL earlier. In Kolkata, he scored only 15 runs in his four overs and bowled economically without any runs on his 16 balls. In this match, left-arm fast bowler Khalil Ahmed also got the chance to get the T20 debut. Fabian Allen (27) became the first victim to be caught out by Umesh Yadav. Fast bowler Umesh Yadav (1/36) in the second over had opener Danham Ramdin (02) caught behind the wicket. In the fourth over, West Indies' chief batsman Shane-Hope (14) was run out in the fourth over while Bhamrah was caught by wicketkeeper Dinesh Karthik in the form of another batsman Hetmeier (10). All-rounder Krunal Pandya, who played his first T20 match for Team India, has already made a mark in the match. After being injured, all-rounder Hardik Pandya's brother, Kunal, took a wicket with 15 runs in his four overs, and then played an unbeaten 21 not out on nine balls. The winning runs also came out of their bat. Kurnool did not score any runs in 16 balls in his four overs. Seeing his economical bowling, Captain Rohit hit him four consecutive rounds. In the first over, Pollard hit six on him. In this over, left-handed spinner gave ten runs but in the next three overs, only five runs have been spent. Subsequently, his colleague, Mumbai Indians, became his first victim. Team India's Chinnaman bowlers Kuldeep Yadav also completed his hundred wickets in the T20 format in the first match of the series. Kuldeep Yadav was the only one from the first five out of the West Indies. Kuldeep, who has had a miracle of taking five wickets in T20, made himself a victim of Bravo, Powell and Braithwaite. He has completed a century of international cricket in international cricket. The spinner in Kanpur, who runs a spectacular form, has done well in this year's ODI series with 45 wickets. In the matter of taking wickets in ODIs, he is second on the list after Afghanistan's Rashid Khan (48). The Indian team had announced its 12-member team a day earlier and instead of left leg-spinner Yuswendra Chahal, left-handed wrist spinner Kuldeep Yadav was given prominence. In this match, the Indian team included Umesh Yadav in place of Bhuvneshwar in the final moments. It is being told that his health was poorly, but he is fully expected to fit in the second T20 in Lucknow. The West Indies team also included three new players - Oshne Thamas, All-rounder Khari Pierre and batting all-rounder Fabian Allen - in this match. Alain was the top scorer with 27 runs from the West Indies innings. Darren Bravo returned to the team, who got to play his first international game after the first T20 after November 2014 and after November 2016. Ink Hopes were not previously part of the T20 team but were inducted when Andre Russell was injured.